The 4th Weapons of Mass Destruction-Civil Support Team (WMD-CST), Georgia National Guard (GANG), is one of the first ten WMD-CSTs established and validated by the U.S. Department of Defense in October 2001. The CST is tasked with providing emergency response personnel and capabilities for chemical, biological, radiological, nuclear, high-yield explosives (CBRNE) incident response, natural disasters, mass entertainment security, humanitarian, and other emergency scenarios. The 22 personnel comprising the 4th Weapons of Mass Destruction-Civil Support Team (WMD-CST), Georgia National Guard (GANG), provide support to civil authorities at domestic CBRNE incident sites by identifying and assessing hazards. They also advise civil authorities and facilitate the arrival of follow-on military forces during emergencies and incidents of WMD terrorism, intentional or unintentional release of CBRN materials, and natural or man-made disasters. Working with fellow state, federal and local authorities, the 4th WMD-CST is challenged with a wide variety of response missions from live monitoring at large-draw sporting events and concerts to weather-related disaster scenarios and CBRNE-related attacks against civilian targets. The 4th WMD-CST is comprised of full-time Army and Air National Guard personnel. Specialty vehicles organic to the 4th WMD-CST include an advanced echelon command vehicle, mobile operations center and a unified command suite which provides a broad spectrum of secure communications capabilities. Additionally, the team can deploy with an analytical laboratory system vehicle containing a full suite of analytical equipment to support the characterization of hazards. In addition to Georgia, the 4th WMD-CST provides response capabilities to the southeastern states of North and South Carolina, Tennessee, Kentucky, Florida, and Alabama. The 4th WMD-CST represents the tip of the spear for the Georgia Army National Guard’s 201st Regional Support Group (RSG), responsible for the Homeland Response Force (HRF) mission across the entire southeastern U.S. In the event of a large-scale emergency response, the 201st RSG can bring nearly 1,200 personnel with capabilities in search and rescue, decontamination, site security and medical treatment. 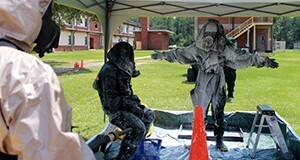 The southeast region presents unique challenges for WMD response, particularly in the form of human terrain in the state of Georgia. Urban traffic density in the Metro Atlanta area rises from six million to seven million people as motorists take to the roads for their daily commute. The 4th WMD-CST must consider alternate transportation routes and modes of response due to limitations imposed by regular commuting traffic. As Atlanta is a regional hub for large-draw events such as concerts and sporting events, traffic patterns and civilian population densities can fluctuate greatly. While urban population centers such as Augusta, Macon, Savannah, and Columbus present transportation and response challenges, vast sections of the state are rural and agricultural and thus have fewer developed road and utility networks. This was recently demonstrated when Hurricane Michael struck several southwestern counties of the state. Not only were roads blocked by debris, power outages contributed to an austere response environment. In addition to human variables, the state and southeast region impose their own set of meteorological and terrain challenges. The physiography of the southeastern United States ranges from mountainous terrain in the northern states to flat coastal plains in the south, and Mississippi River in the west. The region experiences a wide variety of extreme weather conditions from snow in the northern areas to flooding, tropical storms and hurricanes impacting coastal regions. Temperatures vary seasonally, but the region may also experience radical changes of temperature and humidity from one day to another. These variables all contribute to the challenges inherent in planning for and responding to CBRNE incidents across a large and diverse geographic area. Terrain, population and mission requirements determine the deployment of strike teams. These teams are staffed based on the capabilities required by each specific mission and typically range from 6 to 12 personnel. This number varies widely based on the response requirement as well as the local response capabilities that the 4th WMD-CST is being called to augment. Thus, the unit trains to employ personnel and resources of varying number and capability across the southeastern United States. The 4th WMD-CST is organized into Command, Survey / Decontamination, Operations / Communications, and Medical / Analytical functional areas. Unit personnel remain on 24 hour, 7 day a week alert and are required to be prepared to respond at a moment’s notice to real-world emergencies and training missions. Unit personnel coordinate responses with state, local and interagency partners for emergency and planned response scenarios. In joint operations, the 4th WMD-CST may provide specially trained personnel as part of a Joint Hazardous Assessment Team (JHAT). A JHAT may be deployed for large-draw events such as sporting events that will have a significant interagency presence. In addition to WMD-CST personnel, a JHAT may be comprised of personnel from the Georgia Bureau of Investigation, fire or emergency personnel, K9 handlers, hazardous materials response technicians or other personnel to meet the anticipated mission needs. Personnel arrive on scene hours or days before events with detection equipment capable of detecting CBRNE hazards as well as emergency protective equipment such as hazardous materials (HAZMAT) suits. Hazard sweeps are conducted prior to and during events with the intent of determining if hazardous conditions are present, assessing the level of the hazard and determining necessary mitigation steps. Personnel must balance maximum caution with minimum disruption to events. In cases where a hazard is suspected or confirmed, the onsite strike team leader determines the appropriate response level. Responses may vary from additional hazard characterization or the establishment of control zones for evacuation of venues. Personnel of the 4th WMD-CST recommend courses of action based on their knowledge and training in hazard identification and assessment to interagency partners. For the 4th WMD-CST, all responses begin with preventative preparation and assessment. Personnel assess potential threats on a case-by-case basis and take into account variables ranging from prevailing winds to event population density. A recent training event involving coordination for Super Bowl 53 underscores the importance of preparation and interagency cooperation. The 4th WMD-CST received three weeks of training with interagency partners to practice anticipated response scenarios. The training focused on threats from explosives and incorporated radiological and HAZMAT response simulations. Team members practiced rapid initial detection and removal for full testing and trained to recognize and contend with false-positive identification. These drills are practiced by the 4th WMD-CST regularly, but focused event-specific training for large venue events are critical to mitigating loss of life and human suffering. Practicing under real-world conditions using calibrated sample agents and utilizing highly sensitive detection equipment is critical, particularly when evaluating agents for which any concentration above detection limits can have harmful effects. The 4th WMD-CST also works with the Georgia Emergency Management Agency (GEMA) and the Georgia Department of Natural Resources (DNR) Environmental Protection Division to respond in the unlikely event of a release incident involving one of the state’s nuclear power plants. The 4th WMD-CST supplements DNR personnel and capabilities in field and facility monitoring during steady-state operations and as part of programmed exercises. Federal Emergency Management Agency (FEMA) requires regular response exercises for potential release scenarios and in which the 4th WMC-CST augments DNR field teams with survey and operations personnel. One such training exercise involving personnel of the 4th WMD-CST, GA DNR and FEMA took place recently at a nuclear power plant located in a rural county of Georgia. The 4th WMD-CST personnel organized into field monitoring teams and were dispatched to pre-determined monitoring points within the suspected impact area. Stationary and mobile sweeps were conducted to identify peak radiation dose rates downwind of the simulated release origin. Once the zone of impact had been determined the teams collected confirmatory air samples to quantify the impact. Analytical results of air samples were provided to GEMA personnel to enable them to determine appropriate protective actions for local populations. Recommendations in such scenarios might include sheltering in place or evacuation. Medical responses such as the issuance of potassium iodide to block radiation uptake may also be considered by civil authorities. In addition to initial impact identification, 4th WMD-CST members are capable of determining and projecting impact plume distances and migration direction and speed for various agents. Personnel also train to accompany DNR field teams to conduct environmental samples from vegetation, soil, water and milk within affected areas. The characterization, monitoring and sampling capabilities of the 4th WMD-CST are all geared towards providing decision-quality data and information to civil authorities who must determine appropriate response measures for localized or regional hazardous impact.